FÅRÖ, Sweden — In liberal Sweden, five-week vacations are mandated by law, so the prosperous often take off in the summer for this island southeast of Stockholm, accessible mainly by a combination of planes, cars, and ferry. In July and August, 5,000 tourists pack Fårö (pronounced “Foreh,’’ with a rolling “r’’) for hikes, bicycling, and jolting leaps into the brisk Baltic Sea. “It’s much like your Martha’s Vineyard,’’ I was told by a Fårö visitor with a summer house. But winters are desolate and fierce, with soaring winds and blinding snow, and the less than 100 who hunker down are defiant old-timers. The last fishermen have moved on; there’s one cattle farmer left. The sole filmmaker who resided year-round on Fårö died, at age 89, in August 2007. That was Ingmar Bergman, whose prolific art-house career included “Wild Strawberries,’’ “The Seventh Seal,’’ “Persona,’’ and “Fanny and Alexander.’’ Among the most revered directors in the history of cinema, he was the island’s most famous citizen. And now he is its primary attraction for movie fans, especially during Bergman Week, an annual summer festival that is open to the public. It was in 1960 that Bergman first arrived on Fårö, for the filming of his bleak existentialist classic “Through a Glass Darkly.’’ The craggy, stormy ambience fit perfectly with his vision, and, also, the truly extraordinary light. 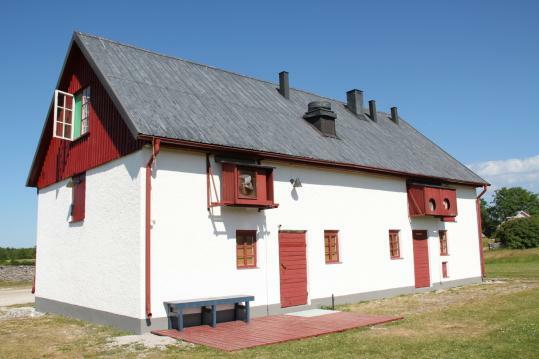 Back then, no tourists were allowed on Fårö, site of a top-secret Swedish military base. But Bergman loved it immediately. In an epiphany, he told his cinematographer, Sven Nykvist, that he would soon buy a house on this island, and make more movies there. Someday, he would move permanently to Fårö. And he wished to die there. The promises of half a century ago were kept, including a home and the filming of such world-renowned masterpieces as “Persona,’’ “Shame,’’ “The Passion of Anna,’’ and “Scenes From a Marriage.’’ Bergman sold his Stockholm apartment in 1993, and transferred to Fårö all his belongings. Living alone at the end, he expired in his Fårö bed. He’s buried in the graveyard of Fårö’s only church. Bergman honored Fårö. How could Fårö honor him? I found out recently when I was one of eight international journalists invited by the Swedish Institute to not only participate in Bergman Week, which promised screenings, lectures, and special guests, but to venture where few outsiders went before. In addition to seeing where on the island Bergman shot his famous films, we were the first press allowed to watch movies in Bergman’s private theater, and to tour Bergman’s house. Our initiation was a conversation with Liv Ullmann, star of four key Bergman features made on Fårö, starting with her dazzling film debut in “Persona.’’ For some years, she was married to Bergman, and, for some months each year, they resided in Bergman’s Fårö house. She had returned there this spring for the first time since his funeral, because their once-shared home, thanks to the Bergman Estate Foundation, was opened to selected guests. At this secluded spot, she and a Norwegian cast rehearsed “Long Day’s Journey Into Night.’’ Later this year, it will be presented on the Oslo stage, with Ullmann as Mary Tyrone. Venturing inside, where our group would preview brand-new Swedish features provided by the Swedish Film Institute, we found a tapestry of Bergman’s film of “The Magic Flute,’’ and 16 plush chairs in three rows (admire but don’t sit in Bergman’s designated seat in front, marked by a wool-covered back pillow). A rushed trip through Bergman’s house later revealed a library stocked with books by playwright August Strindberg, his hero; several Bibles, of course; and, surprising to me, many novels by Isaac Singer. Bergman’s huge VHS tape collection had the expected classics — Tarkovsky, Fritz Lang, etc. — but also random films revealing, perhaps, an eclectic movie taste. Did this high modernist really watch “The Blues Brothers,’’ “Blood From the Mummy’s Tomb,’’ “Elvis! Elvis!,’’ and Adam Sandler in “Anger Management’’? I lingered by the double bed with a white cover in which Bergman died. On another occasion, we visited Fårö Church, where Bergman, often angrily skeptical of God, apparently worshiped. He’s buried in a private spot far from other graves. His grave is shared with his last wife, the non-actress Ingrid Bergman. She had passed on before him, but her body was exhumed and brought here. Gerald Peary is a Suffolk University film professor and a filmmaker (“For the Love of Movies’’). He can be reached at gpeary@geraldpeary.com. For more information on Bergman Week go to www.bergmancenter.se/en/bergman-week/programme.